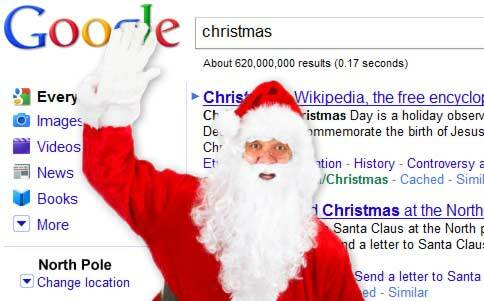 Back before the Internet, it was easy to chalk up Santa Claus’ Christmas efforts to magic. How did he know where every child lived? Magic. How did he know how to get there? Magic. How did he get packages all over the world in one night? Magic. But now, we’ve got explanations. How does he know where every child lives? Google Maps. How does he know how to get to every house? GPS. How does he get packages all over the world in one night? Amazon.com and the magic of overnight delivery. The Internet has brought a similar kind of magic to every one of us. It’s such an integral part of the way we both handle our professional and personal lives that we come to expect it as a necessary utility, like having heat for the winter. And in many ways, that’s exactly the case. So as you dream of excellent holiday tidings with Internet-bought and Internet-enabled gifts, let’s not forget exactly how things would look differently if we didn’t have the World Wide Web at our fingertips… even our our little winter vacations. Here are five ways things would be different this holiday season without Internet. For many people, holiday traditions mean bridging gaps between families – sometimes, these are substantial gaps. Of course, I’m talking about travel. Sure, the GPS satellites might not necessarily be your connection to the Internet, but not everyone gets around with GPS these days. We still rely on Google Maps, Mapquest, Yahoo Maps, whatever – if there’s a web site with maps, we find it. And we look up and print off our directions based on those maps. Some traditionalists will use their paper maps to get around still, or will even get to their regular holiday destinations by good old-fashioned memory. But as the generations turn and traditions change, the ability to Google your way to your destination will become more a part of holiday traditions than eggnog. Life wouldn’t end without Google Maps or GPS, of course. People found their way around before, and a simple phone call asking for directions is still sufficient in many cases. But you have to admit instant directions make our lives just a little easier, don’t they? 2. Less communication with the outside world. Whether you think this is a good or a bad thing, it’s hard to deny that our connection to the Internet has made our standards of communication and access to news somewhat lofty. We expect to check the news at any instant we choose; simply firing up the computer and checking our e-mail or Facebook page is all we need to feel connected and up-to-date with our personal lives. Some would argue that the holidays are precisely about shutting off this kind of superfluous communication and focusing exactly on the communication that matters: real, in-person relationships with the people we love the most. You can’t debate that. But it’s hard to debate that the way we behave over the holidays without the Internet would drastically change many of our yearly experiences. If you’re like me, you don’t mind turning the wireless off and ditching technology for a day or two. If you’re doing the holidays right, you should really be too busy for technology anyway; by the end of Christmas day, for example, you might think to yourself wow, I haven’t read any news or checked my Facebook in days. It’s funny how often we log back on the morning of December 26th and realize just how little we’ve missed. Maybe #2 was an improvement from the Internet world, but without online shopping, our holidays would probably be much, much worse. Crowded malls and department stores, heavy traffic closer to the bustling metropolis near you – who needs it? Online shopping is easy, relatively inexpensive, and very reliable – especially if you get your shopping done earlier. A lot of business is given to the likes of FedEx and UPS over the holidays, and the Internet has only made it worse – or better, depending on who you’re asking. Doing a lot of your shopping online earlier during the holiday season helps you avoid tendencies toward procrastination – after all, you don’t even have to get dressed to online shop. Heck, online shopping in general is a great innovation year-round. It’s a definite improvement over the Internet-less world, and without it, we’re burning a lot more gasoline. 4. More difficult event planning. Who’s hosting Christmas this year? Where will Grandma go? Who’s making the Thanksgiving turkey? These questions are difficult to resolve in the era of rotary phones, but in the era of e-mail groups, they’re a cinch to work out. You simply send a message to all of the relevant people in your address book and – voila! – you’re event planning. Without this nice little innovation, of course, you’ll have to get a little more creative. Conference calls? Cold calling? I don’t even want to know how event planning worked before our modern technology. 5. A better overall experience. What? Better without the Internet? Blasphemy! I am, after all, one of the biggest advocates for the uses of the Internet you’ll find. But even I recognize the power of shutting the computer off, flipping the laptop closed, and enjoying the holidays as they were meant to be enjoyed: with family. Okay, so you can use a little technology. I’m a big fan of fireplaces, for example. But for the purposes of discussion here, “technology” refers to the ability to connect to the Internet. If you can’t go two days – Christmas Eve and Christmas, for example – without using the Internet, then something is seriously out of whack in your life. The world will be waiting for you on December 26th – or even December 27th, for that matter. You don’t need a ton of extra frills or gizmos to have a great Christmas. You just need someone to share it with. Well, okay. Sometimes the Internet helps with that, too.